You are a primary character. Everyone in the same room as you at the end of the game gains the "dead" condition. The Red Team wins if the President gains the "dead" condition. Note: it is possible that the Bomber receives the "dead" condition before the end of the game. 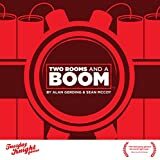 If this happens, then the Bomber does not detonate, failing to provide the "dead" condition to everyone in the same room at the end of the game. 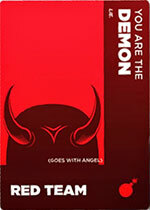 You have the CUPID power: once per game, you may privately reveal your card to two players. You must verbally say to your target players, "You are in love with each other". Those two players gain the "in love" condition. Players with the "in love" condition replace their original win objective with the following win objective: be in the same room with the player with whom you are "in love" at the end of the game or fail to win your objective. 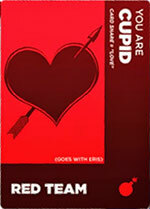 The CUPID power cannot be used on yourself. Note: If a player with the "in love" condition were to acquire the "in hate" condition, the two conditions would cancel one another, leaving the player with neither condition. You begin with the "liar" condition. Players with the "liar" condition must always verbally tell the lie (unless you're "seduced", "hypnotized", or any other condition that may influence your ability to tell the truth). This means that you are permitted to communicate the truth as long as it is not verbally. You are a primary character. Everyone in the same room as you at the end of the game gains the "toast" condition. 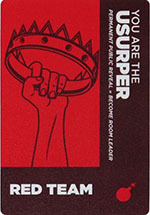 The Red Team wins if the King gains the "dead" condition. Note: it is possible that the Dragon receives the "dead" condition before the end of the game. If this happens, then the Dragon does not breathe , failing to provide the "dead" condition to everyone in the same room at the end of the game. You are a secondary character. You are the backup character for the Dragon. If the Dragon card is buried or the Dragon receives the "toast" condition before the end of the game, you must carry out all responsibilities associated with the Dragon (for example: ending the game in the same room as the King, card sharing with the Eggineer). 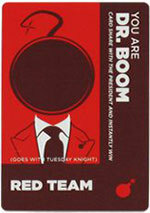 You have the BOOM power: if you card share with the President, the game immediately ends. Red Team wins. Note: the BOOM power never works on the President's Daughter. If the President is buried, the BOOM power is never used. When playing with the Eggineer, the Red Team has the following additional win condition: the Dragon must card share with the Eggineer before the end of the game or the Red Team loses. 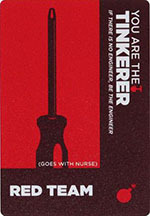 At the end of the game, the Bomber will be asked if he/she card shared with the Eggineer. At that time both players will verify or deny having card shared. Note: remember that if the Dragon character ever switches player control (perhaps due to the Hot Potato), then the new Dragon must card share with the Eggineer. 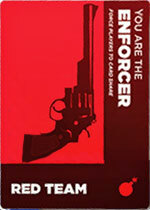 You have the ENFORCER power: once per round, you may privately reveal your card to two players. 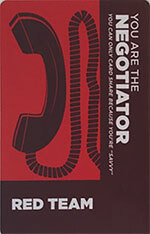 You must verbally say to your target players, "You must reveal your card to one another". Those two players must card share to one another (not to you). 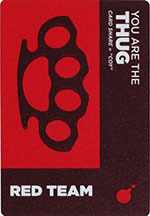 You cannot use this power on yourself, but another Enforcer can use their power on you. 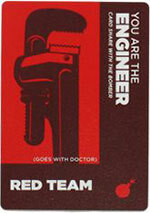 When playing with the Engineer, the Red Team has the following additional win condition: the Bomber must card share with the Engineer before the end of the game or the Red Team loses. At the end of the game, the Bomber will be asked if he/she card shared with the Engineer. At that time both players will verify or deny having card shared. Note: see Doctor/Engineer section (insert page #) for more clarification. Note: remember that if the Bomber character ever switches player control (perhaps due to the Hot Potato), then the new Bomber must card share with the Engineer. You begin with the "flashing" condition. Players with the "flashing" condition may ONLY publicly reveal even when a character's power might force a card share. A Exhibitionist can't card share or privately reveal their card or their color. You are the backup character for the Eggineer. If the Eggineer card is buried or the Eggineer receives the "dead" condition before the end of the game, you must carry out all responsibilities associated with the Eggineer (card sharing with the Dragon). You begin with the "foolish" condition. Players with the "foolish" condition can never turn down an offer to card share or color share. If you card share with the One-Armed Man, the game immediately ends. Red Team wins. You have the GARGOYLE power: whenever you are selected to leave a room (via hostage selection or a character's power) you may publicly reveal your card and verbally say, "Stone", to avoid leaving the room. This means that any character that attempts to force you to leave the room (including the leader) must immediately choose a different player to leave. The GARGOYLE power can be used repeatedly at anytime. Note: the GARGOYLE power can't be used while the leader is out of the room during parlay. You have the GORGON power: any player that card shares with you gains the "stoned" condition. Players with the "stoned" condition may no longer vote. Rather, any time a vote is called for (e.g. in the instance of nominating/usurping a leader), "stoned" players must act stiff with their arms straight down. You are a primary character. The Red Team wins if you are not in the same room as the Blue Drone at the end of the game. You are a secondary character. You are the backup character for the Red Fist. 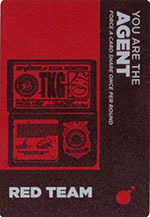 If the Red Fist card is buried or the Red Fist receives the "dead" condition before the bomb is activated, you must carry out all responsibilities associated with the Red Fist. 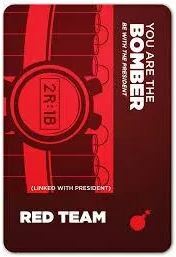 You are on Red Team, if the President gains the "dead" condition, you win. 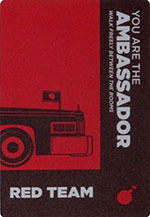 Note: any character card that has the white bomb icon on it is considered to be on the Red Team. 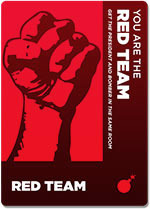 Any player that card shares with you must trade in their character card for a Red Team card before the beginning of the next round and before revealing any part of their card to another player. Your power has no effect on primary characters (President, Bomber, Red Fist, etc)., backup characters for primaries (President's Daughter, Martyr, Firecracker, etc). or any character that is not aligned with either red or blue. 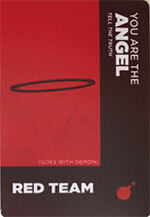 This is a special character card that is the color of the opposite team. 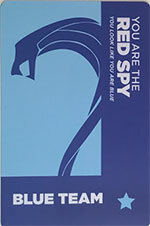 This means, for example, that the Spy has an allegiance to the Red Team, but their card is blue. You are the backup character for the Engineer. If the Engineer card is buried or the Engineer receives the "dead" condition before activating the bomb, you must carry out all responsibilities associated with the Engineer (card sharing with the Bomber). If you card share with the Marshal, the game immediately ends. Red Team wins.